Allow a Smart Meter in Your Home—or Face Arrest! Illinois mothers were arrested for preventing the installation of “smart meters” on their properties. It could happen to you. Action Alert! Naperville, Illinois, a suburb of Chicago, has started the Naperville Smart Grid Initiative which requires so-called smart meters to be installed in every home. Residents opposed to the smart meters have been fighting the initiative for over two years. “The city has always had and maintains the right to access our equipment, and today we were simply exercising that right,” Naperville City Manager Doug Kreiger told the Chicago Tribune. Another Naperville resident, Malia “Kim” Bendis, was arrested on two misdemeanors for resisting a police officer and attempted eavesdropping when she filmed police on the scene, despite a recent federal court ruling that the state of Illinois’s ban on recording police officers in the line of duty was unconstitutional. The US Supreme Court upheld that ruling in November. The group Naperville Smart Meter Awareness has filed motions to dismiss the charges and to grant temporary restraining orders for residents refusing the meters. There is a pending federal lawsuit as well. As we reported in 2011, the meters work on a wireless radio frequency (RF) system, and many people are concerned about the meters’ threat to their health. There are already over 2,000 studies showing negative effects of RF radiation, despite the manufacturers’ safety claims. 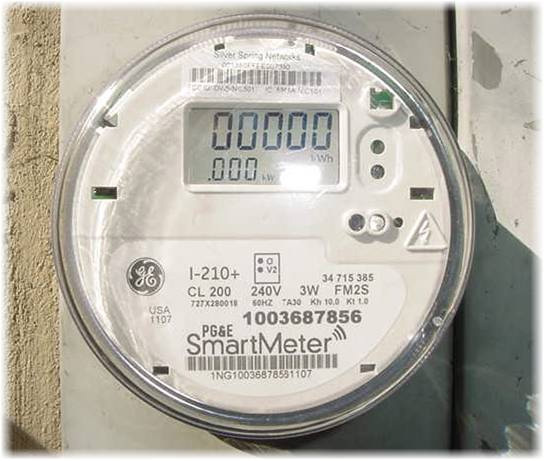 People with the meters installed on their homes have reported symptoms such as headaches, insomnia, and tinnitus. The current medical literature raises credible questions about genetic and cellular effects, hormonal effects, male fertility, blood/brain barrier damage and increased risk of certain types of cancers from RF or ELF levels similar to those emitted from “smart meters.” Children are placed at particular risk for altered brain development, and impaired learning and behavior….The American Academy of Environmental Medicine finds it unacceptable from a public health standpoint to implement this technology until these serious medical concerns are resolved. Opponents of the smart meters have also cited security concerns, because the meters are capable of tracking exactly when a customer is using electricity, and opponents fear it would allow strangers to know when they are home or have gone to work. Some fear hackers could access that information. The city maintains that homeowners can opt out of the wireless transmitters but only by substituting those with an alternative meter at a high fee. The Tribune reports there is a $68.35 initial fee for the alternative meter plus a $24.75 monthly fee for manually reading it. Stahl said residents who want a non-wireless meter should not have to pay for it. The arrests that happened in Illinois could happen in your state. States have a patchwork of laws governing whether residents can opt out of smart meters, and whether there is a fee associated with opting out. These other states allow residents to opt out of having a smart meter: California (up to a $75 analog meter set-up fee and up to a $10 monthly reading), Maine ($40 set up, $12/month), Maryland (fee to be determined, but a grassroots coalition is planning to introduce a bill to eliminate the fee), Michigan (proposed $87 fee, and $15 monthly), Nevada ($108 opt-out fee for northern NV and $99 for Southern NV, $8 monthly charge), and Oregon ($254 analog set up fee, $51 monthly charge). In other states, there is no alternative option offered. For example, in Virginia, residents have been told to accept the meter or have their electricity turned off. The problem, of course, is that electricity companies are usually government-supported monopolies, so they really don’t have to worry about what their customers want. Action Alert! In New Hampshire and Virginia, there is legislation pending that would require customer consent before installing a smart meter; a bill in Maine would eliminate the opt-out fee. If you live in one of these states, we have a special, targeted action alert on these bills. If you live in any state that has no opt-out law, or an opt-out law for a fee, please contact your legislators today and demand that opting out of the smart meter be free of any fees. Please take action immediately! Support HB454, a bill that would allow a smart meter opt-out. Support SB 797, a bill that would allow a smart meter opt-out. Support LD 94, a bill that would remove the smart meter opt-out fee. Tell your state legislators to pass a law prohibiting utilities from charging customers a fee just because they want to opt out of having a smart meter installed on their property. Your state needs a bill that would prohibit electric utility companies from installing a smart meter on a customer’s premises—or requiring a customer to use any advanced meter—unless the customer has requested it, without having to pay a fee. If your action alert doesn’t go through, you’re in luck, your state either already has a free opt-out law, or has no plans to install smart meters at all.